Substance reporter (and founding editor) George Schmidt will be one of the guests on the WTTW television "Chicago Tonight" show at 7:00 p.m. on July 10, 2012. The show, which will also include guests Linda Lenz of Catalyst magazine and Chicago Public Schools Chief Administrative Officer Tim Cawley, will discuss the $5.2 billion CPS budget, which was released to the public on Friday (July 6) and on which hearings will be held on Wednesday, July 11. 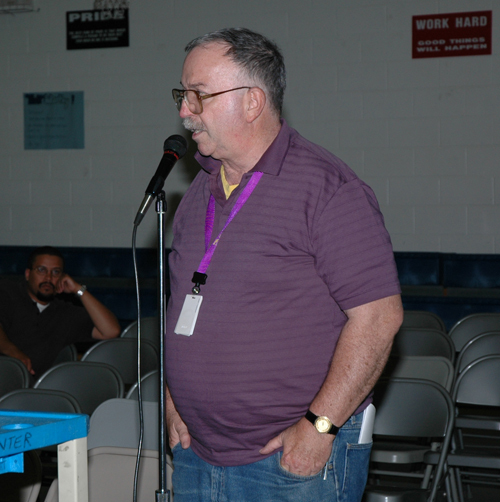 Substance reporter George Schmidt (above, testifying at the June 21, 2006 hearings on the CPS budget at Finkl Elementary School) on Chicago's West Side. Schmidt has been studying the budget for more than 25 years and was part of an expert team that was selected by CPS to re-write the 1989 budget as part of the "Budget Transition Team" that summer. For more than ten years he has either covered the annual budget hearings as a reporter, testified at those hearings, or both. Substance photo.George Schmidt was asked by officials of the Chicago Teachers Union to be on the show representing the union. He is currently a retired CTU member and delegate representing retired teachers, as well as a reporter for Substance and a consultant on budget and other matters for the CTU. In 1988, Schmidt was part of the "budget transition team"
Since then, he has organized studies of the CPS budget and participated in the annual CPS budget hearings, both as giving testimony and as a reporter, for "decades." During the past four years, he had helped organize and train a group of researchers who have followed the CPS budget in detail, with studies ranging from the annual CAFR (the Comprehensive Annual Financial Report) to the Position Files and W-2 files that show CPS spending. George Schmidt cancelled another scheduled activity to prepare for the WTTW show, which airs at 7:00 p.m. on July 10. He has told people that he will be there before 6:30 p.m. to prepare further for the show. He is also preparing to cover the budget hearings on July 11 for Substance, as he has done for years. After interviewing George Schmidt this afternoon, Chicago Tonight assistant Shanika Gunaratha called the CTU and told Stephanie Gadlin, CTU Communications Director, that Tim Cawley "doesn't want to do the show with George." Not true. I contacted Cawley's office this afternoon and later confirmed with him in person tonight that he had nothing to do with the decision. "I had nothing to do with it," Cawley told me. We'll be updating this story later with all the details. Sad to see a fellow journalist lie and tell her colleague "no comment." How does the 'Chicago Tonight' show get away with it? I was really looking forward to hearing George Schmidt analyze the CPS budget, and I'm shocked to hear that the 'Chicago Tonight' show can just dismiss one guest at the request of another. When the "requesting" guest says he didn't object to George being on, "no comment" comes from the mouth of the show's assistant — who lied? Shocking! I had heard over the years that the 'Chicago Tonight' show had blackballed Schmidt. They're allowing their viewers to miss the invaluable information Schmidt would have provided. Why is the show playing so dirty? Whom have they sold their souls to? Come clean George — did you or your kids win the bucket toss? Did you comment on Tom Schillings brother? Actually this is a little bit shocking to me since your appearance would have made for one helluva show. What an intellectual slaughter that would have been.